There is a fairly small subset of mobile users who are adamant that devices should have expandable storage (and will get quite rowdy when the feature is left off of a new smartphone). Unfortunately, that small subset of users makes up a larger proportion of the target market for the OnePlus One, which has made rumors of a secret microSD card slot continue much longer than they should have. 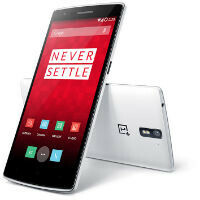 There has long been hope that the OnePlus One would include expandable storage, and the rumor got a boost when the feature was listed in the user manual for the device submitted to the FCC. But, it turns out that what was listed in the user manual wasn't a hint at a secret feature, it was just a mistake. Plenty of outlets have gotten their hands on the OnePlus One already, including Android Police, and no one has found the microSD card slot on the handset, because there isn't one to be found. Cyanogen Inc. has confirmed that the listing in the user manual was a mistake, no word from OnePlus yet. Of course, considering OnePlus is charging only $349 for a 64GB model, it should make it a bit easier to get by without the use of expandable storage. That is assuming those of you who want a One can get your hands on an invite. Yeah I'm a little confused as to why this is here. It was evident early on it didn't have removable storage. At $350 for 64GB of storage it's not that bad. With 64 GB of storage you don't need a sd card. I don't care how much someone feels they need to carry the whole series of Breaking Bad in 720p. You don't need 128 GB of storage on your smartphone yet. But what will we do when boredom knocks??? Maybe you are right in your tiny little land. However, i switched from apple because i dont need self righteous pricks making decisions for me. Even if I don't need 128gb of storage, it is really cool to review my gopro videos on my phone, right after a dive in a bar over drinks with the crew. They 1+1=fail could have just charged 399$ with the sd card, and I would have ponied up the dough. There is no way I will purchase a phone that does not have expandable storage. Ok, I lied, if you give it to me for $50, I'll buy it. I think it had to do with the previous story on how the manual made reference to an mSD slot. Well there was a manual for the phone that said it had an SD slot. I think that caused some confusion. Also, I think the FCC listed the device with the SD slot. Did they ever anounce it having ? I don't remember such a thing. I think somebody at OnePlus got confused between "invite slot" and "SD slot". ---"There is a fairly small subset of mobileusers who are adamant that devices should have expandable storage (and will get quite rowdy when the feature is left off of a new smartphone)." --- There is a much larger portion of us than this leads believe. As a mainstream user with no employed ties to the wireless industry, I can safely say that many of us do no want to be tethered to cloud services which may cost us more money a month. We must observe the popularity of the Samsung line that has inherently recognized these wishes. We must also witness the lack of sale by those other than Apple that can't see this. It amazes me that today's tech enthusiasts ignore the customer control and customization that consumers enjoy. John B.
I prefer cloud, I take to many calls a day of upset people that their SD card has failed and all their pictures are lost. ---"There is a fairly small subset of mobileusers who are adamant that devices should have expandable storage (and will get quite rowdy when the feature is left off of a new smartphone)." --- Agree... this sounds like that telecom tool over at Anandtech, Brian Klug. He was always on the warpath against SD cards, saying you couldn't make a good phone if you had to support SD memory. If you could put a 128GB SDcard in there, what are you gonna do with 256GBs of storage??? pictures, comic books, videos, roms, games, backup files my music collection is 10 gb, movies is about 30 gb, comic book is about 30 gb, rom is about 2gb, misc files / back up is about 10gb. It will still be my back up phone later in year. Hard to stay mad at this even with all the mis steps, hiccups an leaks. Well they were claiming this is a no compromise device, hell thats there whole marketing with the dont settle tag line. Well thats another reason not to bother with it. The more I've heard about this phone the less interest I've had. Just get a "Meenova Mini MicroSD Card Reader" or "Leef Access microSD Card Reader" and a 32GB/64GB/128GB MicroSD Card. Not that hard... No lame dingling micro USB cable too. why do phonearena has to announce it as if it such a big deal most more expensive flagship phones don't have microsd card slot. this company is setting a new standard in smartphone industry. and phonearena is bringing down the image by making the heading of this article like this. I use a windows phone but when I saw this phone and its price it made me want to Get an extra phone. THIS IS A BIG THUMBS UP TO THE COMPANY THAT MADE THIS PHONE AT THIS PRICE. other companies are just making too much profit. most other expensive flagships don't have sd card slot? Please give me some examples. Because samsung, sony, htc and LG got one. They made this article because yesterday OPO had sd card slot on their manual. This is for clarification.